The awards are shown below. Remote Laser Evaporative Molecular Absorption Spectroscopy Sensor System — Gary Hughes, California Polytechnic State University, San Luis Obispo, Calif.
Optical Mining of Asteroids, Moons, and Planets to Enable Sustainable Human Exploration and Space Industrialization — Joel Sercel, TransAstra Corp., Lake View Terrace, Cailf. Sutter: Breakthrough Telescope Innovation for Asteroid Survey Missions to Start a Gold Rush in Space — Joel Sercel, TransAstra, Lake View Terrace, Cailf. Massively Expanded NEA Accessibility via Microwave-Sintered Aerobrakes — John Lewis, Deep Space Industries, Inc., Moffett Field, Calif.
Dismantling Rubble Pile Asteroids with Area-of-Effect Soft-bots — Jay McMahon, University of Colorado, Boulder, Boulder, Colo.
Gary Hughes’s project would use a high-power laser to zap the surface of an asteroid. 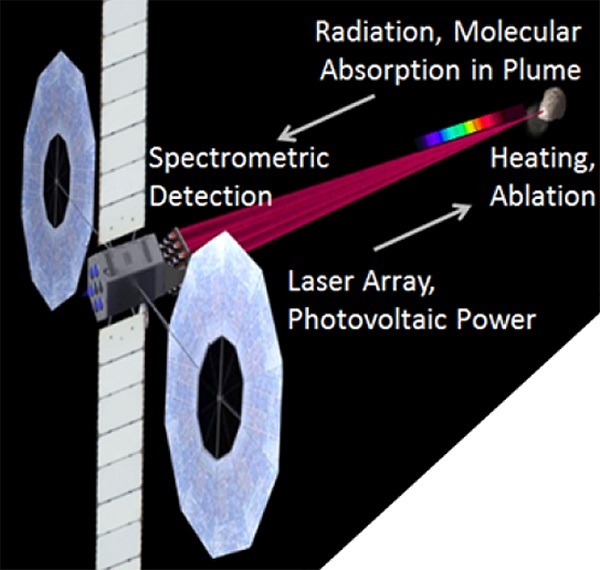 An infrared spectrometer aboard the spacecraft would analyze the composition of the resulting plume. Joel Sercel of TransAstra Corporation has proposed using sunlight to mine asteroids. “In Optical Mining, excavating and processing asteroid materials is accomplished by highly concentrated sunlight which we have shown can be used to drill holes, excavate, disrupt, and shape an asteroid while the asteroid is enclosed in a containment bag,” according to the proposal summary. NASA also awarded Sercel a phase I proposal to develop a trio of telescopes that could search for small asteroids. The system would be called Sutter, after the mill where gold was discovered in California in 1848. “Our concept involves a constellation of three CubeSat scale spacecraft in heliocentric space each 120 degrees apart in the plane of the ecliptic with a semi-major axis of about 0.95 AU,” the proposal summary states. “We estimate that this entire constellation can be built for less than $50M, launched as piggy back payloads, and perform like the billion dollar, 8 m aperture Large Synoptic Survey Telescope (LSST) ground based telescope at finding and tracking small dark asteroids,” the summary adds. 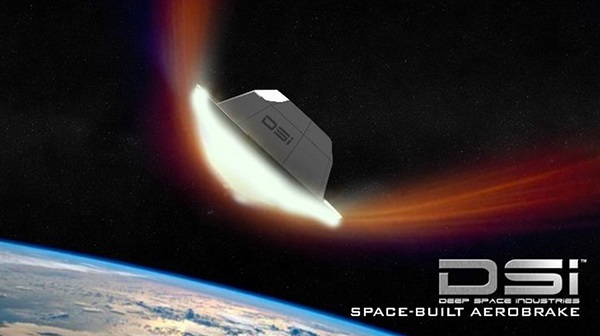 John Lewis of Deep Space Industries was awarded a phase I contract to explore the manufacturing of heat shields from asteroid materials. “We propose to use microwave heating to 1) expedite selective release of H2O vapor from heated C asteroid solids, and 2) sinter highly outgassed refractory asteroidal material to make heat shields for aerocapture at Earth return,” the proposal summary reads. 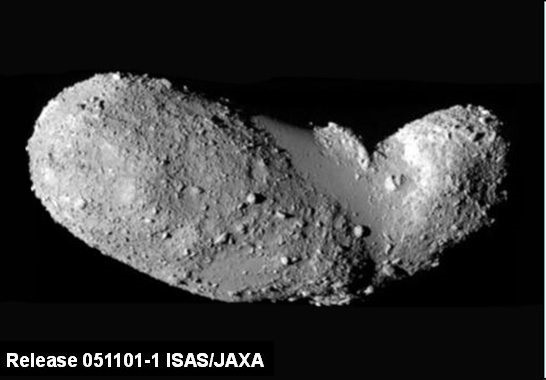 Jay McMahon of the University of Colorado, Boulder was awarded a phase I contract to examine developing mining systems for a different type of asteroid. The summaries of all five proposals follow. We propose a sensor system capable of remotely probing the molecular composition of cold solar system targets (asteroids, comets, planets, moons), such as from a spacecraft orbiting the target. 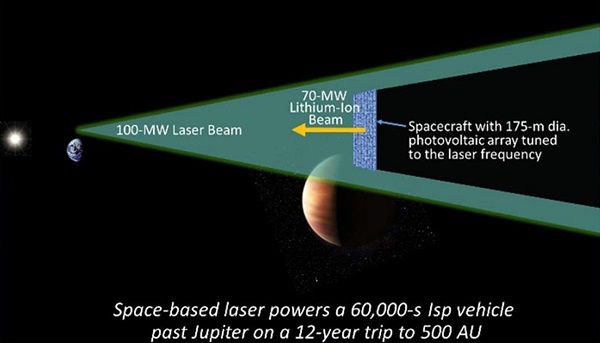 The spacecraft would be equipped with a high-power laser and an infrared spectrometer, both powered by photovoltaics. The laser is directed at a spot on the target, with central flux in the 10 MW/ m2 range. For rocky targets, melting and evaporation of surface and shallow sub-surface material occurs. Due to phase changes, the spot temperature rapidly equilibrates at ~2500 K, but the flux is insufficient to dissociate most molecular species present. Blackbody radiation produced by the heated spot peaks near 1 μm, and travels outward through the evaporated plume. Fortuitously, the equilibration temperature of the heated spot emits peak radiation right in the spectral range where absorption occurs due to molecular rotational and vibrational modes. The heated spot is viewed by the spectrometer through the plume, and absorption lines can be exploited to infer the molecular composition of the target. The remote sensing system uses an artificial backlighted source, and relies on absorption of radiometric energy to determine molecular composition of the target, suggesting the designation Remote Laser Evaporative Molecular Absorption (R-LEMA) Spectroscopy Sensor System. The system is complementary to existing methods such as Laser-Induced Breakdown Spectroscopy (LIBS). The LIBS laser produces sufficient flux to vaporize and ionize the target material; the LIBS optical spectrometer observes characteristic emission from materials in the plasma, allowing determination of the atomic composition of the target. Our Phase I efforts produced an end-to-end model of the sensor system, and simulated operational scenarios were explored. The model includes laser propagation and absorption by a simulated target. Absorption of laser energy drives heating, melting and evaporation of the target material. Evaporation in space environment conditions is predicted, leading to estimates of plume density in front of the heated spot. Finally, plume characteristics are used to calculate the expected absorption spectrum at the spectrometer. Additionally, preliminary experiments were performed to test some aspects of the model, including plume density and absorption. All results obtained during Phase I indicate that the proposed sensor system concept is viable. We estimate the sensor system concept to be TRL-2 at the culmination of Phase I. The Phase II effort would potentially push the system concept from TRL-2 to TRL-4, by building a proof-of-concept laboratory model and running extensive experiments to test the theory developed in Phase I. In particular, Phase I results suggest the heated spot will produce sufficient blackbody flux to be viewed from a distance, i.e., flux is not the limiting component of the system. Phase I results also suggest that much of the absorption occurs within about one spot radius from the target. Thus, spectral detection is limited primarily by ejecta concentration, which is in turn controlled by the spot area where sufficient flux is delivered to produce evaporation. Any operational system should therefore seek to maximize evaporative spot area with available laser power. For the Phase II effort, we propose to execute advanced laboratory experiments to measure parameters of interest, and to compare experimental results to analytical predictions that were developed in Phase I. The Phase II effort would potentially push the system concept from TRL-2 to TRL-4. During the Phase II grant period, we would also develop a roadmap to TRL-5, by specifying a cubesat experiment that could be executed in low-Earth orbit, over a modest distance in the space environment. PI: Prof. Gary Hughes (Cal Poly State Univ., SLO). Co-I’s: Prof. Jordi Puig-Suari, Prof. John Bellardo (Cal Poly State Univ., SLO). Consultant: Prof. Philip Lubin (UCSB). Since the time of that advisory, NASA has conducted many mission and systems analyses, but has yet to publish a sustained mission plan and cost analysis that fits within any budget that Congress will approve. NASA’s vision of human exploration remains unaffordable largely due to the high cost of launching large quantities of drinking water, oxygen, radiation shielding and especially rocket propellant from Earth. An exciting program of human exploration beyond LEO might include an outpost at the top of the Earth-Moon gravity well or on the surface of the Moon; human exploration of Near Earth Objects in their natural orbits; and/or a series of human missions to the Mars system. Water, oxygen, propellant, and shielding can be made in space from resources known to be plentifully available in asteroids and probably in the Martian moon Deimos. Optical Mining technology is a breakthrough approach to harvesting these materials from asteroids, boulders, and regolith in microgravity. 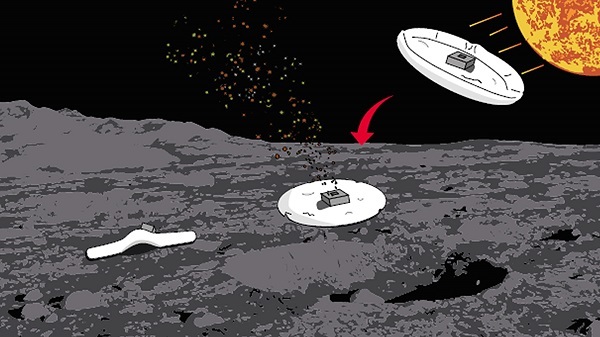 In Optical Mining, excavating and processing asteroid materials is accomplished by highly concentrated sunlight which we have shown can be used to drill holes, excavate, disrupt, and shape an asteroid while the asteroid is enclosed in a containment bag. In our Phase 1 work we demonstrated Optical Mining in the laboratory and performed mission and systems analysis of the application of Optical Mining to human exploration missions. Our mission analysis showed that the most accessible Near Earth Objects (NEOs) can be used to provide NASA with mission consumables for human exploration in deep space with the potential of saving up to $10B/yr or $150B over the 15 year operational life cycle of a human exploration program. This savings alone would be enough to transform NASA’s vision of human exploration from being unaffordable to being affordable within budgets that Congress can approve. Phase 1 technical work included a full scale (8 kW) Optical Mining demonstration using a high fidelity CI-type asteroid simulant in vacuum using sunlight from a 10 m diameter solar concentrator without mechanical contact or downforce. This work confirmed our physics based mathematical model of the excavation and volatile extraction process and scalability of results from 36 prior, small scale (≈ 1 cm diameter) demonstrations and tests. In our Phase 2 work we will complete mission and system analysis of the application of Optical Mining to an exciting program of human exploration and we will mature the technology of Optical Mining to the point at which NASA can baseline this approach for an affordable program of human exploration. 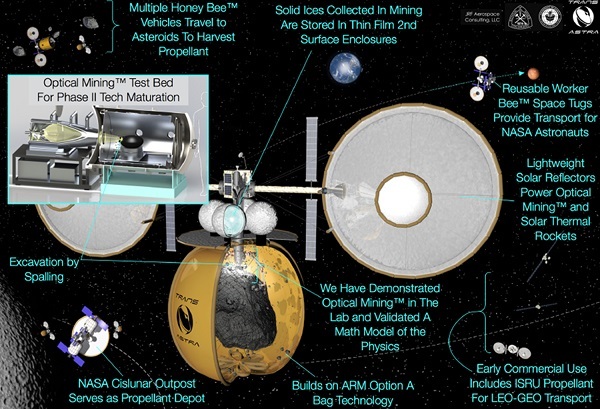 Our mission studies will address the production via Optical Mining missions to extract and retrieve resources, consumable processing, storage, and application of consumables to human exploration mission in cislunar, NEO and Martian space. The mission studies will be tightly coupled with our laboratory work. Laboratory work will include the development and integration of a 30 kW Optical Mining test apparatus in our laboratory and integration with our high quality vacuum chamber for a test program involving Optical Mining. PROBLEM: These are three primary reasons why it is important for NASA to develop better ways to locate and characterize Near Earth Objects (NEOs). First, NEOs are an impact hazard to the Earth and Congress has mandated that NASA find 90% of all the objects over 140 meters by the end of 2020. NASA will fail to meet this mandate because of the high cost of current asteroid survey approaches. Second, measuring the NEO population distributions in space will unlock the answers to critical questions dealing with the formation and evolution of the solar system. Finally, NEOs are exciting candidates as targets for human exploration and they represent a virtually unlimited resource of valuable material for radiation shielding, propellant, and life support consumables that could make NASA’s envisioned deep space human exploration program affordable. Current models suggest that for every > 140 m NEO, such as those targeted by the Congressional mandate, there are about twenty intermediate sized (>40 meter class) objects. Intermediate sized objects are more likely to impact the Earth with detrimental effect but are not efficiently identified by current survey methods. One such example was the Chelyabinsk meteor which hit Russia in 2013 damaging 7,000 buildings and injuring 1,491 people. Going further down the size scale, for each 140 m object there are over >1,000 ten meter objects and more than >8,000 five meter objects. Due to their large numbers, these smallest of NEOs are the most likely to be highly accessible as space resource and human exploration targets, and because their size makes them easier to capture and work with using reasonably sized equipment, they are ideally suited as sources of ISRU space resources. Unfortunately, no sky surveys or methods currently being conducted or planned can find a significant fraction of these most plentiful and valuable but elusive small volatile rich targets. CONCEPT: To solve this critical unmet need we envision a new type of low cost, high performance compound telescope, the Compound Synthetic Tracker (CST) which we propose for a series of new space missions that takes advantage of recent advances in electronics, CubeSat technology, laser communications, and off-the-shelf optics for camera zoom lenses. The first space mission concept we propose based on CST is the Sutter Survey, named after the Sutter’s Mill discovery which led to the California gold rush. The Sutter Survey project can lead to a gold rush in space to exploit the resources of the small highly accessible NEOs that we intend to find and characterize. As depicted in the summary chart, our concept involves a constellation of three CubeSat scale spacecraft in heliocentric space each 120 degrees apart in the plane of the ecliptic with a semi-major axis of about 0.95 AU. We estimate that this entire constellation can be built for less than $50M, launched as piggy back payloads, and perform like the billion dollar, 8 m aperture Large Synoptic Survey Telescope (LSST) ground based telescope at finding and tracking small dark asteroids. Beyond Sutter Survey is Sutter Extreme, a New Horizons class mission that performs beyond the flagship level to increase the discovery rate of dangerous impactors by more than 24X and find and characterize more than 7,500 new NEOs every year.